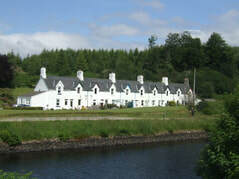 ​Crinan Canal holiday cottages are two self catering traditional two bedroom canal side cottages with log fires and sleep four on the banks of the Crinan Canal, Cairnbaan, on the West Coast of Argyll. Both cottages are ideal bases for walking, sailing, fishing and cycling along the nearby tow path towards Lochgilphead, nearby woodland tracks and Kilmartin. Both cottages have private front gardens and have free Broadband and free Wi-Fi. There is a bike and wood store in the lane at the rear of the property. Minimum stays varies throughout the year. Entry is usually available after 3pm and departure is by 10am or by pre arrangement. Below is the search button for the dates you want to start your holiday and all pre-set options from that date will be shown, (only the shortest options are indicated on the calendar). Changeover days can be flexible outwith peak seasons.